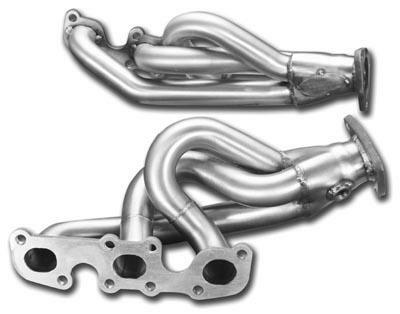 STILLEN Performance Headers - Dezod Motorsports Inc - Home of the automotive performance enthusiast since 2002. STILLEN Headers are the finest available. With months invested in development work, these headers produce big increases in streetable power and torque on both naturally aspirated and forced induction vehicles. The design of the headers allows better and more efficient exhaust scavenging which contributes to the dyno tested performance gains. With STILLEN’s 20 years of experience in designing and manufacturing Nissan performance parts, you should have complete confidence that every STILLEN product is of the highest quality and has under gone extensive research and development before production. STILLEN manufactures our high performance headers from varying materials according to application parameters. All of our uncoated headers are stainless steel for long life and corrosion resistance. Our ceramic coated headers are for those who want an additional thermal barrier to lower engine bay temperatures as well as excellent stain and rust resistance. These hand crafted shorty headers do not require the removal of the catalytic converters. Installation should be done by a qualified mechanic with proper tools and a lift. This is not a backyard bolt on. STILLEN headers generally do not remove the cats, but are not 50 state legal, check your area’s regulations.